The provincial Ministry of Highways and Infrastructure has established the general route for the Saskatoon Freeway and is seeking approval for the final two segments of the bypass from Saskatoon city council. The route entails a swath of about 500 metres inside which the final location of the actual highway will be built. “Now comes the nitty gritty of narrowing the corridor down,” ministry spokesman Steve Shaheen said in an interview Thursday. The freeway is supposed to branch off in an eastward direction from Highway 11 between Floral Road and Baker Road south of Saskatoon. 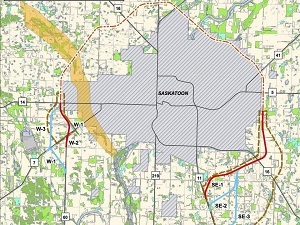 It would then loop around the east side of Saskatoon before circling north to connect with Highway 7 on the west side. As expected, there are no plans for the freeway to cross the South Saskatchewan River south of Saskatoon and west of Highway 11. The top half of the route has already been approved by the City of Saskatoon and the Rural Municipality of Corman Park. That part of the route includes a bridge planned for just northeast of the north commuter bridge that is scheduled to open in October. The northeast portion of the freeway also passes through the ecologically sensitive Northeast Swale, close to where an extension of McOrmond Road will connect to the north commuter bridge. Never miss the Construction Links Network news – Subscribe today!